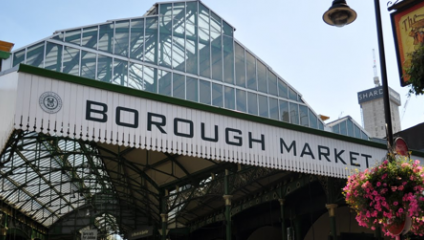 Borough Market, situated on the south side of London Bridge and nestling beneath railway arches next to the imposing Southwark Cathedral has been in existence in one form or another in the area for over 1000 years. The food market has seen a healthy resurgence in recent years and on Thursdays, Fridays and Saturdays, tourists and Londoner’s alike flock in their thousands to sample the gastronomic delights that are served up by an ever increasing array of cheese mongers, bakers, butchers, artisans and fruit and veg stalls or to just simply watch the world go by in one of the many cafes, bars or restaurants. However, the area has much more to offer than great food. Here are just five intriguing places you might wish to explore, either within or around the market itself. The fact that William Shakespeare’s brother Edmund was buried there in 1607 and the Czech etcher Wenceslaus Hollar produced his famous ‘views of London’ showing the city pre and post the Great Fire of 1666 from the spire, or the 4th Century Roman deity found during building work are a reminder of just how much change this imposing building has seen over the years. It’s well worth popping in to have a look around or spend a few moments in peaceful contemplation away from the hustle and bustle of the market. You might like to see how many of William Shakespeare’s characters you can recognise in the stained glass Shakespeare window, and American’s might be interested to know that local boy John Harvard was baptised there, and later gave his name to a rather well known American college. A few minutes walk from the market on Redcross Way lies a small patch of land untouched by property developers and the large fence separating it from the quiet road is festooned with all manner of weathered flowers, ribbons, trinkets and decorations. Since medieval times, much of the area came under the jurisdiction of the Bishop of Winchester, who amongst other things made a lucrative income from licensing the many brothels in the vicinity. The women who made their living by this means were known as the Bishop of Winchester’s Geese, but as sinners, and in an all too familiar twist of hypocrisy were of course denied the right to be buried in consecrated ground when they died, and were consigned to the area now known as Cross Bones Graveyard. The graveyard was effectively closed in the 1850’s and the shrine like appearance is largely due to a theatrical performance that took place at the nearby Southwark Playhouse in 1998 called ‘The Southwark Mysteries’. The performance ended with a procession to the gates where upon the ribbons and trinkets were hung. A similar celebration has taken place every year since. Film fans might like to see if they can spot a few film locations that have appeared in a number of well-known films in recent years. The Globe is a cosy little pub that has unfortunately become sandwiched between two railway lines since it was the home of Bridget Jones in the film versions of Helen Fielding’s Bridget Jones’s Diary. Numerous other scenes were also filmed around the market including the infamous ‘fight’ scene between Hugh Grant and Colin Firth. Before he scored the lucrative Sherlock Holmes franchise, Guy Ritchie’s first film ‘Lock Stock and Two Smoking Barrels’ was filmed at various locations all over London. The building next to what is now a Paul Smith shop on Park Street was featured as the location for the hideout. Harry Potter fans might be unaware that they are standing next to the entrance to the Leaky Cauldron, which the florist’s Chez Michele on Stoney Street became for the Alfonso Cuarón directed Harry Potter and the Prisoner of Azkaban. At one time, Borough High Street was littered with coaching Inns, but now only the National Trust owned George Inn partially remains. Just a few minutes walk from the market and built in the 1670’s the George Inn is the only galleried coaching Inn left in London. Unfortunately, the eager advancement of the railways saw two sides of the George destroyed in the 19th Century to be used as a depot, but nevertheless, the courtyard is a popular drinking hot spot in the summer months, and like many pubs in London claims Charles Dickens as one of its patrons. A brief mention in Dickens’ Little Dorrit justifies this, but those of a literary inclination might like to learn that what is probably the most famous alehouse in literary history once stood on the very next street. Talbot Yard and what is now a printing and stationery company, was once home to the Tabard, from where Geoffrey Chaucer’s pilgrims began their Canterbury Tales in 1388. Shakespeare’s Globe theatre stands proudly for all to see on Bankside, just a short walk down Clink Street from Borough Market. It is a recreation of the original Globe theatre erected in 1599 by a theatrical troupe known as the Lord Chamberlain’s Men, whose most famous member was the world renowned William Shakespeare. The actual site of the original Globe can be found on Park Street just behind the current reconstruction, and although occupied by a small block of flats and a car park, can still be visited. If you happen to be there on a Saturday, then you can also view the remains of the Rose theatre (only 50 yards away), which was the first Elizabethan Theatre in the area and the Globe’s nearest rival. The discovery of the Rose’s foundations in 1989 largely contributed to the understanding, development and recreation of the Globe. Now housed within an office building, it is possible to visit the Rose’s watery remains and watch a fascinating video about the area in the Elizabethan period, the discovery and archeological importance of the Rose and the subsequent recreation of the Globe. Jonnie Fielding runs Bowl Of Chalk www.bowlofchalk.net and provides ‘pay what you want’ London walking experiences. You will not only discover more about Borough and Southwark, but a host of other areas of London.